Fresh on the bowhunting scene for 2011, Archer Xtreme has combined state-of-the-art materials and manufacturing technologies with good, old-fashioned field smarts. Headlining Archer Xtreme's new accessory lineup is the Carbon Carnivore -- one of the best looking, high-functioning sights on the market. The first thing you'll notice is its stylish appearance, thanks to the 5mm woven carbon blade and 3mm woven carbon pin housing. In addition to looking great, this carbon material absorbs vibration and has no "memory," which means it won't bend and take your pins out of alignment. Woven carbon is also extremely strong, making the Carbon Carnivore virtually indestructible. Even better, carbon shaves considerable mass from the sight, which weighs just 6.9 ounces. 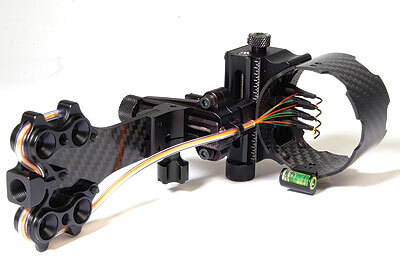 Carbon structural components are complemented by machined aluminum parts, stainless steel windage and elevation micro-adjustment drives, second- and third-axis adjustability, adjustable bubble level, rear-mounted LED light and stainless steel, .019-inch aiming pins, each backed with 11.5 inches of continuous flow fiber. The Carbon Carnivore even offers a unique EZ Tech pin system that allows you to fine-tune the elevation of each individual pin using a small dial. Combine those quality materials and high-end features and you have a versatile sighting system that goes way beyond good looks. "It's one thing to just throw a piece of carbon on something," Archer Xtreme President Mark Garcia said. "But if you look at the fit and finish on that sight, it's the equivalent of taking a high-end target sight and making it perform like a NASCAR race car."